Just about every year an Alabama writer publishes a Christmas book and, in the season, I review it here. Over the past few years we have had “The Holiday Season” by Michael Knight, “The Christmas Letter” by Lee Smith and “A Redbird Christmas” by Fannie Flagg. All of these are good reads. I had one this season too—“A Gift of Bones” by Carolyn Haines—but I foolishly reviewed it prematurely in November and none arrived to take its place. That sent me on a search of the bookshelves. 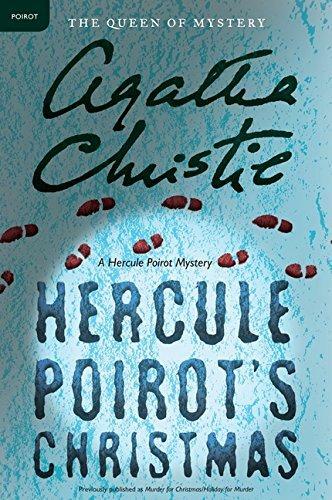 The result: a classic by Agatha Christie, “Hercule Poirot’s Christmas,” first published in 1938. This mystery could not be any more orthodox. The action takes place from December 22 to December 28, in Gorston Hall, a country house in Middleshire. The master, Simeon Lee, a millionaire who made his fortune in South Africa, is an invalid, an old, nasty and cruel man. He has decided there will be a holiday family gathering. We guess he wants to torment them. Besides his son George and his wife, who live at the hall, he has invited his estranged artist son David and his wife; son Alfred, now an MP; son Harry, the globe travelling ne’er-do-well—a remittance man; and his granddaughter Pilar, who is coming from Spain, fleeing the Civil War there. Christie gathers these disparate characters and then, at drinks, dinner and drawing room scenes, shows us how much they dislike each other. The brothers quarrel, the wives fuss. What they generally agree upon is that tyrannical Simeon, who was unfaithful and cruel to their mother, is a monster. Meanwhile right down the road, Poirot is by chance visiting an old friend and colleague, Colonel Johnson, Chief Constable of Middleshire. They are discussing crime at Christmas. Johnson naively suggests that the holiday season is not a good time for murder. No sooner has Poirot spoken than Superintendent Sugden calls to tell them Simeon Lee has been murdered. The family all heard a great clatter of violence and furniture crashing. They raced to his room to find the door locked and then, breaking it down, discovered old Simeon with his throat cut. Christie has produced a country house mystery and a locked room mystery, and every person in the building has an alibi and most have motive. Poirot goes to work and has it solved by Boxing Day.